A year ago, Richard and I took part in the Grim Reaper Ultra 70 mile race. It was a step up for us. We had run the Brecon Beacons Ultra in 2014, which was 46 miles but we didn’t feel ready to make the leap to a 100 mile race. I mean it’s a hundred miles for goodness sake. So we settled on attempting 70 miles. The story of that race is here, suffice to say Richard won it and I came 5th after a major bonk at 30 miles. This year we headed back to Lincolnshire with one plan, to beat our times from last year. We had initially planned to run the Grim Reaper Ultra 100 mile option but having completed the South Downs Way 100 just a few weeks before we decided one century was enough for this year! 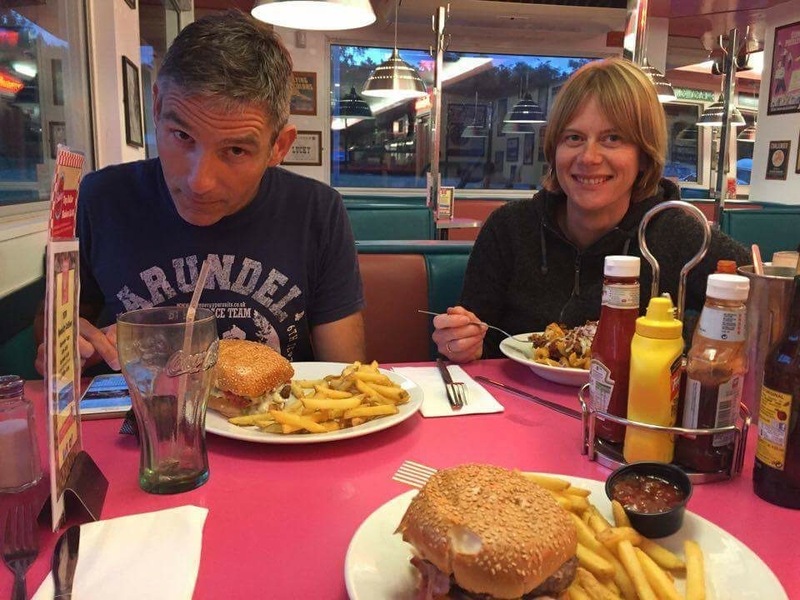 We agreed it would be more interesting to try and better what we did last year and bang out the 70 mile race again. Our friend Gemma, whom Richard had just about beaten into second last year, had signed up to do the 100, so we felt a little bad dropping down to 70, but we knew we could still support Gemma on the course. The Grim Reaper Ultra is a race which is growing in popularity. It’s held in the beautiful surroundings of the Grimsthorpe Castle estate near Bourne, Lincolnshire. The house and gardens are open to the public and it is certainly a very picturesque setting. The main building is a cross between a castle and a stately home and overlooks a lake and the vast estate on one side. The entrance gates are approached on a long drive lined with trees and lush green lawns. On race weekend the lawns on one side of the approach are used for camping and are covered with tents of all shapes, sizes and colours. There are three race options. You can run 40, 70 or 100 miles on a 10 mile course round the estate. The loop includes a variety of scenery and terrain which keeps it interesting. There are no aid stations en route but at the end of the loop you have access to your tent and there are some basics on offer at the registration tent, such as crisps, nuts, bananas and water of course. You can also get a coffee if you don’t mind waiting six hours for the kettle to boil. This year, Richard and I were lucky enough to have my wife crewing for us. Victoria would be there to have hydration and nutrition ready for us and to make sure we didn’t hang around too long at the tent at the end of each loop! 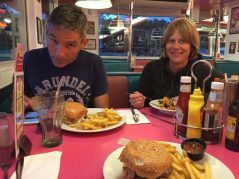 The three of us arrived on the estate a little late in the day after a stop start car journey from the south coast and a huge burger and chips meal at an Ok Diner on the A1. We had to set up the tent in the dark, but at least it wasn’t raining. With race start not until 9:30 we had plenty of time in the morning for breakfast, photos, registration, clothing and kit prep. We were able to get hot water from the registration tent for our mini porridge pots and there was plenty of bottled water for us to use. Registration involved collecting a race number and a little device for clocking into the checkpoints on the course, which was attached around the wrist. I had decided that, as I filmed last year’s race, which you can see here, I wouldn’t be filming this time. So I had no batteries, SD cards or cameras to mess with. I had various changes of clothing if needed and my Salomon Hydration vest. I have recently taken to using the soft flasks in the front of the vest rather than the bladder in the back. For the first lap, I filled both flasks with water. Keith, the Race Director, gave the briefing just before 9am. The way the tents and registration area is set out means that as you finish a lap, you most likely pass your tent on the way to clock in at the end of the lap. You would then have to back track to your tent to refuel or change or whatever. It made a lot more sense to us to take time at the tent first and then essentially leave to go out on the next lap passing the registration tent to clock in and then out immediately after. We confirmed with Keith that it was ok to do this because we were convinced the rules were different last year. The Grim Reaper Ultra starts at the top of the hill which leads down from the castle to the lake. It sounds idyllic and indeed it is. The race was started with the loud crack of a whip at 9:30 and we were off. Richard went off like a crazy man, as did Adam Holland who was doing the 100 but set off like he was running a marathon. I had a plan to complete each lap in around 1 hour 40 minutes and I wasn’t going to be drawn in to going after Richard. He would complete the first lap in 1:21! The course drops down to the lake and snakes round the edge before leaving the tarmac and climbing a dirt track. This track meanders through fields and a small wood emerging back on a tarmac road for a mini climb to the forest section. This climb is easily runnable in the early part of the race but becomes a definite walking section later on! Once off the tarmac the climb can be muddy and slippy but it’s not long before you come out to a wide open forest and a long, straight, flat part of the course, where you run on soft grass for about a kilometre. Out the other side of the forest and there’s another section of dirt road which winds for what seems like forever before you turn right on to an old railway line. This is a lovely part of the Grim Reaper Ultra course, along a cool, tree-enclosed, high-sided path. You run for a mile before passing under a bridge. Soon after comes the first checkpoint half way round the loop. You take your dibber thingy and pop it in the device. Once it beeps you know it’s logged you. Then comes the worst bit of the course. 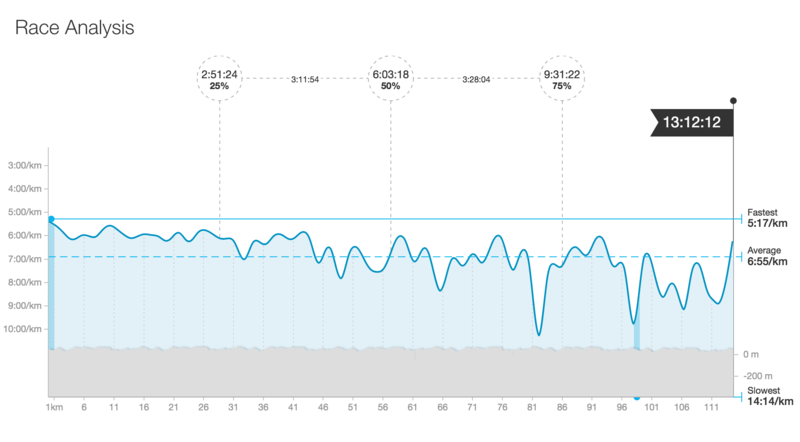 Believe me, as the laps tick by this next section becomes the bit you just have to grind out. It’s a 5k section of tarmac heading from the furthest point away on the loop back towards the castle. It’s flat and mostly straight and seems to go on forever. You can see the castle in the distance for much of it too. There is a very welcome downhill at around 4k and once you get there you know you’ve nearly done it. Finally comes a left turn back on to the grass on the opposite side of the lake from where you were at the start of the race. You run a hundred metres by the lake side, over a ford and then left, up a gradual incline in a field to the second checkpoint, 3k from home. There’s another gradual descent through corn field and another climb in to another small wooded area, a final field and then the last kilometre on a path through the woods to the driveway of the castle. Running up the drive with the castle in front of you is a welcome sight even at the end of the first lap! Other runners, crew and supporters all clap as you make your way along the driveway. It’s a good feeling. I took my first lap nice and easy and kept to pace. When I got to the tent, Victoria told me that Richard was already 15 minutes ahead, but that I shouldn’t panic and should stick to the plan. One part of the plan was not to spend very long at the tent at all. Last year I spent far too long feeling sorry for myself at the end of each lap and I was determined to keep aid station stops to a minimum this time. One quick drink of Coke and I was off for lap 2. Contrary to what we expected the sun was out and it was getting very warm. I passed Gemma at some point on the second lap and she was suffering and worried she might not make it round the 100. At the end of the first lap Richard was in the lead in the 70 mile race and I was 7th. However, over the course of the second lap, although I was keeping to pace, I seemed to be passing an awful lot of people. I thought I must be moving up the rankings at least one or two places. The thing is, without asking as you pass, you don’t know who is running 40, 70 or 100 miles. By the third lap I had got Coke in one of my soft flasks, I had eaten a baby food sachet and had consumed one mug of Huel. I was determined to try and keep the bonk away as long as possible! This time last year I was really starting to feel it and was completely done in by 30 miles. Thankfully no such problems in 2016. I got to 30 miles and still felt like I had energy to keep running. I had also decided I was going for a swim! Last year on every loop we passed a spot next to the lake which was perfect for going down to the water’s edge and perhaps dipping your toes in the cool water. Well, it took me all day but on lap 6 last year I couldn’t resist any longer and I stripped to my pants and waded in. It was lush and soooooo refreshing. So on returning to the Grim Reaper Ultra I made it my mission to get in that water as often as possible. Despite going out with the intention of racing and trying to get a decent place, I just could not say no to that water. I deliberately took a spare pair of pants in my backpack on lap 3 and when I reached the spot, about 4km from the end of the loop, I stripped to my pants and socks and dived in. I only spent a minute or two submersing myself, but it was wonderful and I’m sure it put a spring in my step. I obviously lost a bit of time but it may be that in fact I gained time because of how fresh and alive swimming made me feel. Victoria had told me at the beginning of lap 3 that I had moved up to second place. When I got out of the water the only people who had gone past were quickly caught and passed again soon after, and I don’t think they were 70 mile runners anyway. I went in the water again on laps 4 and 5. We had agreed that when we were approaching the end of a lap that we would text or phone Victoria to let her know what we needed and she would have it ready for us when we arrived at the tent. Towards the end of lap 3 I phoned and was surprised to learn that Richard was still there. When I got to the tent Victoria told me that I was definitely catching him. A quick coffee and a fill up of the flasks and I was on my way again. I was half expecting to see Richard up ahead at some point round the loop, but I didn’t see him until the next time I arrived at the tent, after 40 miles. He was almost ready to leave, so I tried to be ready in time to leave with him. I didn’t quite manage it and he sped ahead as we left the checkpoint. I was running quite well. I was running the first part down to the lake and up the dirt track, but by now I was walking up the tarmac climb and up to the forest at around 2 miles. I was ok running through the straight forest section and all the way along the railway line. I would then stop and walk for a few metres after the first checkpoint before starting the long road run. My reward for running all the way along the road was my swim at the end. It was so hot that I ran half of lap 4 and all of lap 5 shirtless, and although my hydration vest did rub a bit, I think it was worth it. Once the swim was done, it was a very short climb to the second checkpoint and from there it really felt like I was almost home. It certainly helped breaking the loop in to sections like that in my head. I phoned Victoria at 18:13 on lap 5 and Richard had not arrived at the tent. I was just a few minutes away. When I got there he was collapsed on the floor looking like I felt! We knew we were both in first and second place but now we knew the person in third place was not all that far behind. We had to get a move on to avoid being caught. We left together. I had now swapped Coke in one flask for full fat milk. I get sick of the sugary stuff after a while! Richard’s wife Tanya texted to say that the person in third was a lady called Helen and she was only 10 minutes behind. This certainly gave us something to think about and we fair shot round lap 6. Thankfully it had started to spit with rain and the cooling effect certainly helped. I didn’t go swimming, although we did throw water over ourselves at the ford just beyond my swimming spot. Sick episode over, mouths washed out, we got on our way. It was getting dark now and so it was time for head torches. We were still keen to make sure we weren’t caught and so we ran the entire first section. However, once we hit the long, flat forest bit we got a phone call from Victoria. Helen was now 28 minutes down. We were pretty much home and dry unless something completely disastrous happened. Looking back I think this demotivated us somewhat. We both agreed we would allow ourselves to walk a little and we agreed we weren’t bothered about coming in under 13 hours. Initially I was saying I wanted to finish in 12 hours something….even if it was 12:59! But by the time we reached the road with 8k (5 miles) to go we knew we weren’t going to make that. It’s difficult to know who was more knackered as we approached the end of lap 7. Richard certainly said he needed to walk on a few occasions, most significantly up the gradual hill to the second checkpoint. But I too was very happy to walk a good portion of that last loop. I don’t think either of us wanted to make a race of it in the end. It would have felt wrong to fight it out and so we agreed that we would share first place. Seeing as Richard had a trophy from last year, I could keep this year’s bling. It might have been interesting to see which one of us could have grabbed the win from the other in the final 20 miles, but having run on our own for 50 miles it was nice to have company for the last two laps. 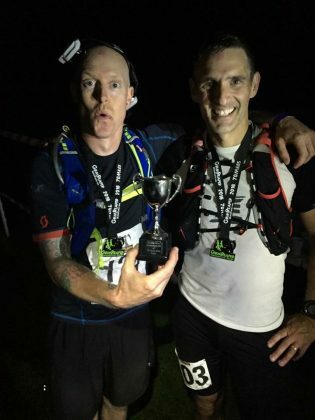 Richard and I ran up the drive to Grimsthorpe Castle at 10:43pm and checked ourselves in as joint winners of the 2016 Grim Reaper Ultra 70 Mile Race, then promptly fell on the floor in a heap. My first race win and Richard’s second although he has also been fastest to the marathon point in a couple of 6 hour timed events. He’s not entirely sure if these count as race wins. Victoria was very excited and we were very grateful for a lot of remote support from club mates and friends on Facebook. Although we didn’t respond personally as we were too busy running, Victoria was passing on messages to us. I was presented with the winners trophy which, annoyingly, is a lot smaller than the trophy Richard got last year….Ggrrrrrrr. A quick word about ‘crew’. I am almost certain that my wife saved us half an hour or more by having things ready for us at the tent and stopping us from getting too settled. We may not have won otherwise. Massive thanks to Victoria for being absolutely brilliant. If you want to race then having good crew support will help enormously. The funny thing about the win is that Adam Holland, who was running the 100 mile race, was actually quicker than anyone on the course at any distance! He was fastest to 40, 70 and 100 miles finishing the 100 in 17:35 and breaking the course record. Incredible running. Our nemesis, Helen Etherington, finished just 24 minutes behind us in the end for a ladies win and 3rd place overall. Gemma suffered very badly in the early part of the 100 mile race. She fought the usual physical and mental demons, but battled through and finished her first 100 mile race in joint 8th overall and first lady. She is definitely a fighter that one. Only 18 runners finished the 70 mile race, 8 runners managed the full 100 and there were 75 finishers in the 40 mile race. The winner of the 40 mile race was Dudley Desborough who completed the course in 5:45. The final 40 miles competitor checked in at 24 hours and 52 minutes. That’s nearly 6 hours and 15 minutes per 10 mile lap. You’ve got to be tough to stay out there for that long. I had real problems getting to sleep after the race because my left leg kept cramping up badly. 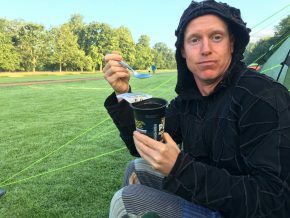 I ended up getting out of the tent and sitting in the registration tent watching runners clocking in and out through the night, whilst eating a Pot Noodle! Perfect race recovery food! Kudos to anyone who was out there overnight in those dark forest sections when it started to rain. I think I did get a couple of hours shut eye in the end but I was very tired the next day. Surprisingly my legs were not too bad at all. Aching of course but nowhere near as badly as I remember they did the previous year. Toenails all intact, but a bit of chaffing because I forgot to put vaseline on my nether regions and because I did a lap and a half with no shirt on. So the question is, should you come and do the Grim Reaper Ultra? I think overall yes. It is a beautiful course in a beautiful location. But there are a couple of minor gripes. Camping. In 2015 it cost an extra £15 per person to camp on site the night before the race. In 2016 this went up to £18 per person. I don’t go camping very often at all but I know that is very expensive. If you live locally then maybe you don’t need to camp, but by the number of tents I think most people who took part were there the night before. It just seems a lot of cash to have to hand over having already paid a significant amount for the race itself. Which brings me to the race fee. The charges are reasonable when compared to charges for other races of similar distance. £90 for the 100 mile option is pretty good. But then you have to consider what you are getting for your money. With a Centurion race there are numerous very well stocked aid stations en route, manned with an army of helpers. You get a t-shirt and a medal or buckle and there are prizes for the winners. The Grim Reaper Ultra has no aid stations round the course. There’s no need really. It’s a 10 mile loop and everyone carries their own supplies. So, money saved there. The one aid station at the start/finish area is minimal at best. Perhaps it’s all you need but maybe not all you’d want. It’s also very frustrating if you want a coffee or tea and there’s no hot water, so you have to wait for the kettle to boil. Why not just have a couple of portable water boilers? On finishing you do get quite a nice medal but nothing else. Certainly no goodie bag, although you don’t generally expect one for an ultra, but no t-shirt. There are no official race photos either for free download or to purchase. Keith and the other staff are friendly and approachable and I know they want to make the race a success. I don’t know what relationship they have with the landowner or what their financial position is, but from a participant and supporters perspective it could be so much more than it is. There could be plenty of activities laid on for families and children on the lawns on race day to keep everyone entertained. There could be stalls selling good coffee and healthy snacks. Perhaps live music or an announcer to tell the crowd who it is that’s currently running up the drive and what lap they’re on etc? For the money, runners should have access to one really good aid station at the start/finish area. Just one, with sandwiches, fruit, sweets, chocolate, crisps, nuts, cake, biscuits, Coke and juice. Again, take a look at Centurion Running or White Star Running to see how this is done. You should get a t-shirt or a cap or a buff or a something along with your medal. And, if the Grim Reaper Ultra wants to start attracting some good runners, it needs to supply some decent prizes to the winners. At the very least they should get a free entry to next years event. Also it seems that a lot of runners use the Grim Reaper Ultra as their first ultra event. It’s a good course but it’s very runnable and the elevation is not horrendous by any means. So it feels like the race should cater for ‘newbies’ and families. I know when I start going off on one it sounds like a real moan. It’s not, these are little gripes and many will not agree with me arguing that they like the quiet, understated nature of the event. I am just trying to find the passion. I want to see the organisers really love their race and want to make it great for everyone, rather than penny pinching. If you love your event and your customers the event will grow and the money will come. I know it takes a lot of hard work to put on these events and I have the greatest respect for and gratitude to those who do. Having said all that, I have loved my two Grim Reaper Ultra experiences. It’s exciting to camp out the night before and night after the race. It was awesome to go swimming in that lake and to run round that lovely estate. The start/finish area with the castle and the view is stunning and just thinking about it does make me want to go back. If you can stomach the cost of camping on top of your race entry fee and you’re happy to cater for yourself and just get on with it, then the Grim Reaper Ultra is a seriously lovely race to do as a novice or an experienced ultra runner. Great review Stephen! You guys did brilliantly! Thanks for my mentions, I had no idea how I was doing compared to you as I knew I never had a hope in hell of catching you! Well done again!